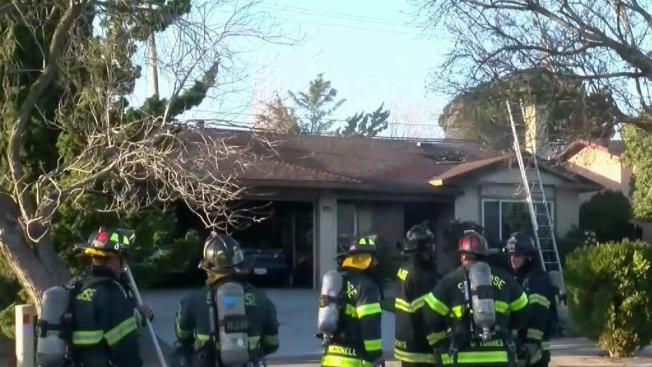 An elderly man and woman suffered minor burn injuries in a two-alarm house fire Sunday afternoon in San Jose, according to the San Jose Fire Department. Fire crews responded to the blaze at a home in the 3100 block of Kermath Drive in northeast San Jose about 4:40 p.m. and found flames in the attic and blowing out one side of the home, fire officials said. A second-alarm was called due to its proximity to a neighboring home. Both victims were taken to a hospital with minor burn injuries, and the house appeared to be a total loss, fire officials said. The victims were receiving aid from neighbors and the Red Cross, fire officials said.